First let me say, Happy Fathers Day to all the dads out there. I myself am the proud father of two wonderful children, Jarrett and Lindsay. Jarrett is still with us and I am so proud of all he has accomplished and all he is yet to do. My Lindsay girl is spending Father’s Day with here eternal Father, but I know she is smiling down on her earthly dad. Settle in somewhere comfortable because this is a long one. I am sorry but I have a lot to share and it takes a lot of words to do it. I have had numerous people ask me “How do you do it? How do you get up every morning and carry on? How do you make it through each day?” There are so many answers to these questions, so many reasons why, and behind every answer there is a person, a family member, a friend, an acquaintance and sometimes a perfect stranger. It seems that everyday someone says or does something that keeps me going. Whether it be a hug, a smile or just a look, it always seems to come just at the right time. It could be the smallest of gestures or the grandest act of kindness. This blog will make number fifty-two, a full year. I have been writing to help relieve the weight of grief, to do my best to explain what a father goes through when he loses a child, and hopefully, help someone who has been dealing with the loss of a child. In this blog I want to share some of the kindness, some words of encouragement and the little surprises that keep me going. Whether it was a long hand written letter, or a picture with the smallest of reminders in the background so many things have helped me get up every morning. So many things have changed in my life, I see the world with very different eyes and feel with a softer heart. I watch videos of “America’s Got Talent,” and I cry each and every time there is a “Golden Buzzer.” I am not sure if its tears of happiness for the contestant or sadness over the fact that their dreams are coming true and Lindsay’s never will. When you lose a child your entire emotional world changes. You cry at things you never would have before, you smile at the smallest sign of kindness, and you wonder, you always wonder, “What if?” It has been 656 since Lindsay left us and it has been 656 days of struggle. You may not see it when you see me smile or hear me laugh, you may not see it when you see me enjoying life, but the struggle is there, it is always there. The struggle lives in a place I try so hard not to reveal, but when it reaches flood levels I have to open the levy and let it flow freely. I need to release the pain and the hurt that fuels the daily pain of losing a child. As I said, I want to share a big part of what keeps me going, what I turn to when grief starts to over power my heart, and the joy that comes from each word, each thought and each photograph. 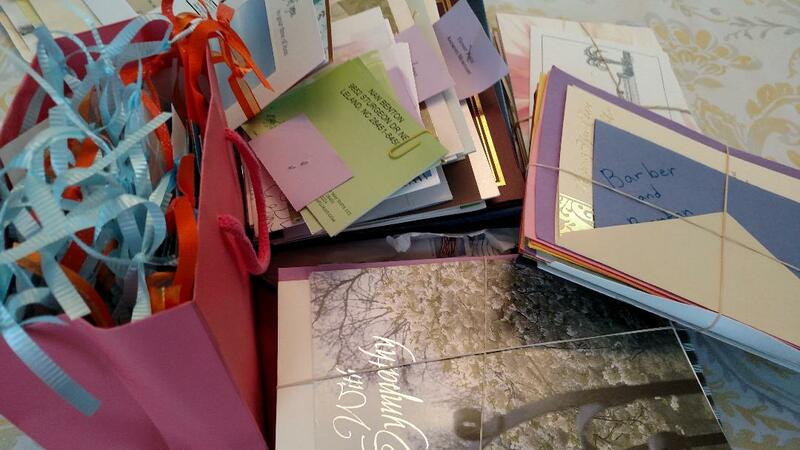 We received so many wonderful cards of encouragement, love and sympathy when Lindsay passed away. The came from family, friends, neighbors and many from people we did not know. I have keep each and every one of those cards and letters and on the days I feel I need some help, I feel I need to close those flood gates I pull them out, I read them and I know everything will be okay. 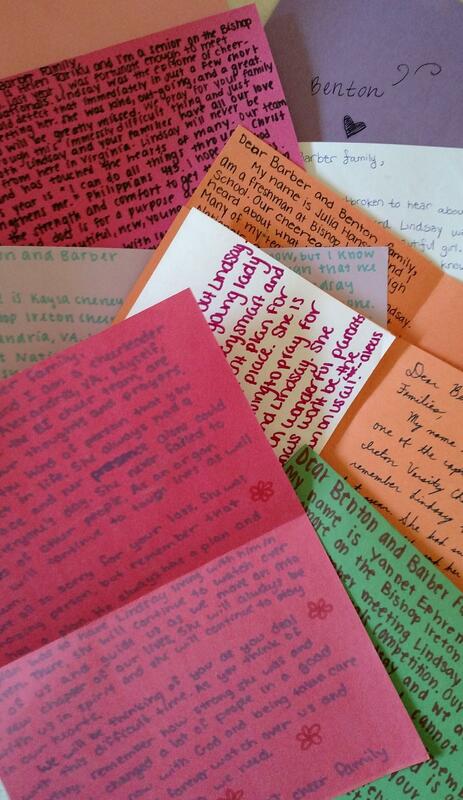 The photo on the right are all hand written letters from cheer teams that met Lindsay at state competitions. The top right are mounds of cards and letters we received. The bottom right is one of the many cards we received from complete strangers telling us how Lindsay had touched their lives. This is how I make it through everyday. There was one very special card with a photo enclosed. It was from my Aunt Betty and Uncle Jimmy. The photo is of my uncle Jimmy holding Lindsay her first Christmas. We were at their house for our traditional Christmas eve party and Ms. Lindsay was being very fussy. My uncle Jimmy held her and she calmed right down. He held her for most of the night and she was quite happy with that. We had a memory tree at Lindsay’s service and this was my uncles memory of her. Speaking of the memory tree, I would like to share just a few of the beautiful words written by visitors to Lindsay’s service. This idea was given to us and set up by a complete stranger who lives in Compass Pointe who came to our home to speak to us, she too had lost a child. It is also the little surprises that get me through the day. The small simple things that I never knew about that find their way to my heart. The first photo below is from a video taken by Haleigh, a friend of Lindsay’s, in her dorm room. I was watching the video and noticed a small white canvass hanging on her wall. On that canvas where just the words “Love Lindsay” with Lindsay’s signature heart. 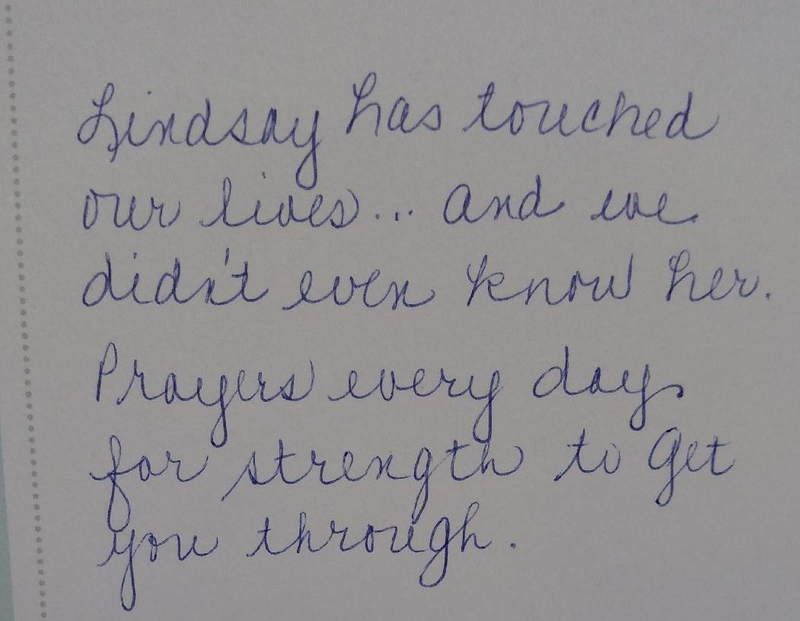 This was from the a birthday card Lindsay sent to Haleigh before she passed away. The second photo is from an exchange student that meet Lindsay at church. She had the logo from the foundation tattooed in memory of Lindsay. The third is of two amazing friends of Lindsay’s, Sierra and Rebecca. We try our best to stay in touch with as many of Lindsay’s friends as possible. Sierra sent this to Kellie, Lindsay’s mom. The last two photo’s, are a drawing of roses that Lindsay drew and gave to Heather, her best friend. On Heather’s eighteenth birthday she had it tattooed on her back in memory of Lindsay. Every athlete wore these with love. The lone megaphone at nationals. What can I say about Wilmington Christian Academy? Every time I walk on that campus I can feel Lindsay with me. The entire academy has been so supportive and loving through out every day since Lindsay has been gone. When I am there I truly feel like part of a family. They continue to help us with the Lindsay M. Benton Cheer and Art Fund as well as the Lindsay M. Benton Cheer Scholarship. The top two photographs are of Heather Reynolds, the 2017 recipient and Amanda Fisher, the 2018 recipient of the Lindsay M. Benton Cheer Scholarship. The bottom two photographs are of two pieces of Lindsay art work that the school had framed for us. When Jarrett got the tattoo of Lindsay’s EKG with her actual signature it was a mix bag of emotions. On the one hand my little boy had grown up to be a man. Not saying getting a tattoo in any way makes you a man, just stating the fact that he was eighteen. On the other hand my little boy was still my little boy. He did this for his sister, he wanted to be able to tell anyone that asked about it that, “This was my sister.” He wanted to honor her, and in my eyes he did just that. These are the things that get me through the day. Looking back and remembering all the things that people have done to remember Lindsay. There are so many wonderful memories and so many people that have honored her that it would take weeks to mention them all. I want to mention one more. North Carolina Azalea Festival Scholarship Pageant. Lindsay competed in the pageant in 2016 and they did a beautiful job of remembering and honoring her in 2017. The photo below is of a friend of Lindsay’s she met at the Azalea Pageant. I can remember like it was yesterday the two of them holding hands on stage as the results were called out. This is what she sent to us. Last year the STICU at NHRMC was renovated and all the rooms were changed. Someone very special called me and asked if I would like to have the plate from Lindsay’s room. It still amazes me at the heart and soul of some people. The fact that they would even think to ask means to world to me. This blog has been my way to share my grief, share my love, and share what I have learned as a grieving father. It has helped me to ease the pain, it has helped me to carry on, and it has helped me to see life in a totally different light. It has been read in thirty five different countries and reached thousands of people. My hope is that is has helped the readers as much as it has helped me. I would like to share some of the comments I have received on this blog. I am not doing this for my own self satisfaction or gratification but to show how many good people there are in this world grieving, how many people are hurting, and how many people walk the same walk I do everyday. We are almost there, the end. I could not finish this blog without the people who have never left my side. My wife, Kelli. This amazing woman has been with me every step of this journey. She has seen the struggle, she has seen the pain, and she has seen the tears. She has stepped up and she has stepped back, she has been my voice when I needed a break. She has been the one I could lean on and truly express how I was felling. She has never wavered, she has been my rock, and she continues to be my support. I could never in a million life times express how much I love her and thank her. My family. I could not have asked for a better support group. My mom and dad have been there no matter the conversation or the lack there of. They are the foundation on which I have built my life. My brother, one of the most solid men I know, was by my side from the day after Lindsay’s accident until the day he absolutely had to return home. Kathy, Kelli’s mom, was always there everyday with a hug. My niece, nephews, step daughter and step son were here for me but most importantly for Jarrett. I could never thank them enough for all of their love and support. Lindsay’s mom, Kellie and her husband Brett. We all pulled together to support each other, and make it trough the most horrific thing that could ever happen to parents. We stood together when times where the hardest and still today we lean on each other for support. Kellie’s parents, family and friends, thank you for your support then and now. The doctors and nurses at New Hanover Regional Hospital. I could never thank them for all they did for Lindsay. The care, the compassion and the communication they had with us. I am still in contact with some of these wonderful people and hope they will continue to be a part of my life. Each and everyone of you, the readers of this blog. Thank you for your kind and thoughtful words and for your kind and generous support of the Foundation that carries Lindsay’s name. You keep me writing and sharing my heart. Lindsay’s friends that continue to surprise us with photos, stories and love for our family. My son Jarrett, one of the strongest young men I know. He asked to speak at his sisters funeral and he did a beautiful job. He told his story of his sister and the love he had for her. He was so proud of her and her strength. I could not have been prouder of him for standing there, composed and confident in front of over 800 people during the most emotional time of his life. I love ya son. My God, my faith and my belief that one day I will see my daughter again. That I will see her smile, I will see her hair, I will see those all important eyelashes, I will hear that laugh, and I will tell her thank you for being my daughter. Thank you for the seventeen years you gave us back on earth. Thank you for all the lives you saved and all the lives you touch. Thank you for being Lindsay. So the answer to the question…well, there is no real one answer. It is a continual struggle, a day by day battle to combat grief and all its sorrow and fear. It is waking up everyday thinking about what I have lost, but also, everything I have to be thankful for. It is the love of family and friends and the many blessing of life. It is the triumph that has come from such a tragedy. But if I had to give one conclusive answer it would be Lindsay. She keeps me going, she gives me strength, and she gives me sanity. I guess we knew each other pretty well. This is week thirty four of me posting my blogs. I never realized it would reach so many people. Never in a million years would I ever think my words would be read in over thirty countries by thousands of people. I can only hope it has brought some sort of healing to another grieving parent, and some understanding to those looking in from the outside. Today I am going to reintroduce myself, Lindsay and my family. I want to give you an update on what the Lindsay M. Benton Foundation has accomplished in the past year and let you know where we are heading this year. For those of you who do not know me my name is Brad Benton, I am Jarrett and Lindsay Benton’s father. I am writing this blog for two reasons, one, it is very therapeutic for me and two, I’d like to share what I have learned as a grieving father. As many of you know Lindsay was in a car accident on August 21, 2016, it was the Sunday before her first day of class for her senior year. After an emergency surgery, and a week in the STICU at NHRMC Lindsay passed away the following Sunday, August 28, 2016. She was 17 years old. She wanted to help people; she wanted to use her passion to be the best surgeon she could possibly be, she wanted to mend broken lives. Well, in her passing, her dreams were fulfilled, as she was an organ donor and through organ donation she mended and saved lives. Little did we know how many lives Lindsay touched during her time here on this earth. We have heard story after story of her “therapy” sessions, her kindness to strangers and her ability to bring reason to difficult situations. To quote one of her tweets, “Don’t ever argue with me, you will lose.” I am assuming she was not including me in that tweet. She was a tenacious, head strong and independent young woman who had her entire life planned out. She had an infectious smile, a steely stare, and a contagious room shattering laugh. She could melt your heart or make you pound your fist against the wall. She could debate any topic like a pro, and not give up until her point was across. She would hold the smallest of creations with the gentlest hands but she would beat a punching bag until her knuckles bled, and she used gloves. She was a friend, a leader, a captain, an advocate, a lover of life and her guinea pigs. She was also a daughter, and sister, a granddaughter, a niece, a cousin and a friend to many. As parents we think we know our children, but we have come to find we did not know how many lives our daughter had touched. What a blessing it has been to meet so many wonderful people through this. She was my little girl, she was a big part of my heart, she was my Lindsay Lou. Although we all miss Lindsay dearly, her legacy lives on through the Lindsay M. Benton Cheer and Art Fund at Wilmington Christian Academy in adjacent with the Lindsay M. Benton Foundation. The Cheer and Art Fund was established to help the cheerleaders and the parents at WCA. Our goal, through this fund, is to help with some of the cost the parents incur and to allow the cheerleader’s to gain equipment, help with some travel expenses and allow them to be the absolute best they can be. Be the best they can possibly be, this was a goal of Lindsay’s. Through the Lindsay M. Benton Cheer and Art fund the Lindsay M. Benton Foundation also funds the Lindsay M Benton Cheer Scholarship. This scholarship is presented to a cheer leader that is in good standing and has been excepted to a secondary educational institution to peruse a career in medicine. The Lindsay M. Benton Foundation was established to bring awareness to organ donation and the importance of donor registration. The Foundation will also financially contribute to Carolina Donor Services, Patriots In Pink, The New Hanover County Special Olympics, as well as the Lindsay M Benton Cheer and Art fund at Wilmington Christian Academy. We will have one major fundraiser, a volleyball tournament, each year and this year it will be on Lindsay’s birthday September 29th at Capt’n Bill’s in Wilmington NC. We would love for each of you to come and be a part of Lindsay’s legacy. Our first year was hard, it was emotional, it was heartbreaking but it was also rewarding. We are thrilled to announce that we, as a collective group, were able to raise $8,900.00 in ONE DAY at the First Annual Lindsay M. Benton Volleyball Tournament. The total amount raised the first year of Lindsay M. Benton Foundation was over $19,000.00! We were so honored to be able to donate $4,000.00 to Pretty in Pink, New Hanover Special Olympics and Carolina Donor Services! (Our goal was $1,000.00 each!) We were also able to donate $2,250.00 to the Lindsay M. Benton Cheer, Art & Scholarship Fund at Wilmington Christian Academy as well as $500.00 towards the 2017 Patriots in Pink Fundraiser to help Going Beyond the Pink. We as a family, and representing the Lindsay M. Benton Foundation, were asked to attend and speak at conferences, symposiums, state meetings and to hospital staff. This was also emotional, as we relived the day of Lindsay’s accident and the day she passed away, but it was also rewarding to see the smiles, the tears and the hear how Lindsay and our family has touched so many lives. We will continue to speak and tell Lindsay’s story as well as the importance of becoming an organ donor. April is Donate Life month and April 13th is Blue / Green day. Wilmington Christian Academy has asked that we attend their daily chapel on April 10th and share the importance of being an organ donor. I have asked that a special guest join us, the special guest is the recipient of a very special kidney, Lindsay’s. She will be sharing the recipient side of organ donation and how it has changed her life and her families life. Please visit the foundation website at http://www.lindsaymbentonfoundation.com for so much more information on Lindsay, and the foundation. We can also be found on Facebook and Instagram. Please consider being a sponsor, a volunteer, or donating to the Lindsay M. Benton Foundation. Mark your calendars for September 29, 2018 and make your way to Wilmington NC, Capt’n Bill Backyard Grill at 4240 Market St. You can also register your 4 person co-ed team for the tournament the week before the twenty-ninth. Thank you so much for all the support, love and understanding you have shown me and my family. Please continue to keep us in your prayers and please continue to support the Lindsay M. Benton Foundation.